WASHINGTON -- Ray LaHood, President Barack Obamas choice to head the Department of Transportation, said Wednesday that Obama is not going to have to push me very hard to raise fuel economy standards for cars and trucks. 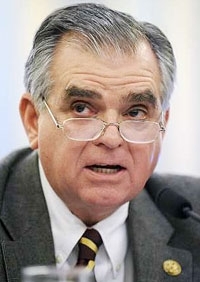 LaHood told senators he would do everything I can to meet an April 1 deadline to adopt higher standards that would take effect 18 months later for 2011 model vehicles. LaHood, 63, is a former Republican House member from Illinois. Obama, a Democrat, nominated LaHood as transportation secretary to help fulfill his promise to name a bipartisan Cabinet. The full Senate is expected to confirm LaHood soon. In December 2007, Congress and President George W. Bush enacted a law that raised the combined fuel economy standard for cars and trucks to at least 35 mpg by 2020 -- an increase of about 40 percent. Last April, the National Highway Traffic Safety Administration proposed rules to begin enforcing the law in the 2011-15 model years, raising standards about 25 percent during that period. The Bush administration pledged to adopt the agency proposal by the end of 2008. But early this month, the Transportation Department said it would leave final adoption to the new administration. Department officials said Obama would face a range of pressing automotive issues, some brought on by the global economic crisis. Regulators concede that automakers will have to invest tens of billions of dollars to add fuel-saving technologies to vehicles.